After days of rain in early September 2013, Evergreen residents watched as torrents of muddy water in Bear Creek roared down hills, flowed over culverts, and wiped out driveways and roads. By September 13, commuters heading to work were met with the closure of a major intersection in town: Colorado Highway 74 at its juncture with County Road 73 just below Evergreen Lake’s dam. 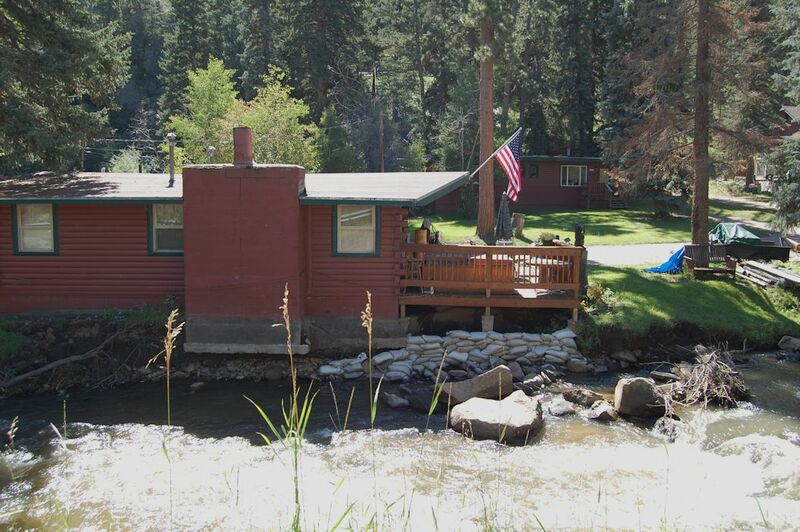 Bear Creek’s headwaters are at Summit Lake in Clear Creek County. After it empties into Evergreen Lake, it moves through Kittredge and Morrison before it flows into Bear Creek Lake in Lakewood. Upper Bear Creek Road, which parallels much of Bear Creek and borders the Evergreen golf course, also was closed. Judy Downes lives on Witter Gulch Road, which follows much of the creek before it meets Upper Bear Creek Road. She and many of her neighbors were pumping water out of their basements. She spent days bailing water and watched as the creek turned into a raging river. At a time when people were driving to work out of Evergreen, Jefferson County Sheriff’s Office closed State Highway 74 above the lake and in the downtown business district at County Road 73. At 7:30 a.m. on Friday the 13th most shops had not opened yet, but the main business district would soon be closed to vehicular traffic with barricades at both ends of town by Jefferson County Sheriff’s Office. Drivers took detours on Douglas Park Road and Meadow Drive. The patio at Cactus Jack’s, a popular saloon nestled in the elbow of that juncture was taking a beating and looked as if it might wash away from the force of the speeding water. It was later rebuilt and restored. In November 2013, high water marks and sandbags record effects of September flooding. Karen Groves photo. At the south end of Main Street the creek was moving so swiftly it looked as though the siding of some structures might be ripped off and swept downstream. A low bridge at Forest Hill Road was almost under water, and an electric pole across the street from the Century Link building was leaning precariously toward the creek. 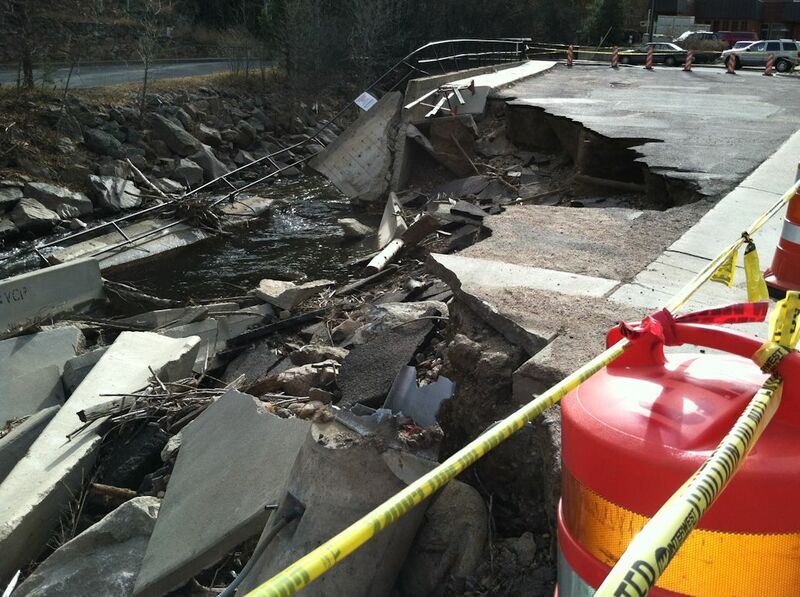 Twisted railing and wrecked paving mark passage of September 2013 floods along Highway 74 in Evergreen. Karen Groves photo. Most of the Evergreen National Bank drive-through parking lot was washed away. What remained: a heaving retaining wall, twisted railing and chunks of asphalt. Deputies told pedestrians ambling along the boardwalk to stay behind the yellow tape draped around the scene. Most businesses were closed. One shop owner said she drove from Marshdale to U.S. 285 then C-470 to Interstate 70 to get to Evergreen. But once there, she dismissed plans to open because there were no customers and part of her shop was flooded. Although Jeffco Sheriff’s vehicles were conspicuously present, as were the Excel Energy workers sent to set up a utility vehicle to brace the electric pole, the road through town was deserted. A few pedestrians carrying cameras gathered at the 74-73 intersection to take pictures. Compared to places farther north, the damage and consequences of Bear Creek’s roar through Evergreen might later be considered unremarkable. Statewide, at least nine lives were lost. Russell N. Clayshulte, manager of Bear Creek Watershed Association, said flows in Evergreen above Evergreen Lake exceeded 1,300 cfs. Bear Creek jumped its channel in many locations and caused flood damage throughout the urban corridor. the River,” by Electra Draper. This entry was posted in historic happenings and tagged floods. Bookmark the permalink.